Don’t mistake this nice looking, sugar-dusted cylinder for some kind of chocolate creation–it’s not. 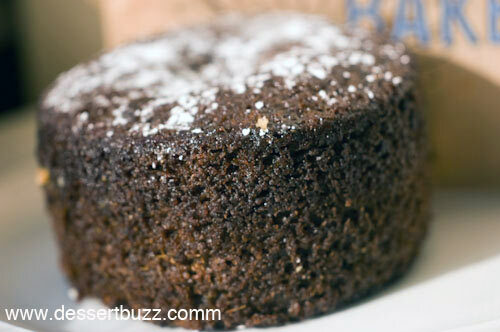 It’s a spiced ginger cake and if you like ginger, real ginger that is, you will love this cake. Even at $4.00 it’s worth it because 1) it’s a big piece of cake and 2) there’s shredded ginger inside! According to Kathy at SE NY, they used whole grain rye which explains why it has a slightly grainy texture (the opposite texture of a brioche). Grandaisy Bakery has three locations in NYC – The Upper West Side location is on 176 West 72nd Street.